Facebook has been coming under fire recently due to controversies ranging from Russian interference in the 2016 elections to the Cambridge Analytica scandal. The role Facebook plays in influencing public opinion is undeniable, and it is easy for someone to use that influence for nefarious purposes with little or no accountability. Because of this, Facebook is making significant changes to the way it treats political ads, specifically in who can run them and how they are shown to users. Back in October, Facebook announced that only authorized advertisers would be allowed to run electoral ads on Facebook and Instagram. Today, it is extending that requirement to any ad that could be considered to be of a political nature, meaning that these advertisers will now be required to verify their identity and location. To decide whether an ad qualifies as 'political,' Facebook is using the help of third parties to develop a list of key issues, which will be refined over time. Additionally, all political ads will now feature a prominent "Political Ad" label on the top of each post, with additional "Paid for by" information beside it. 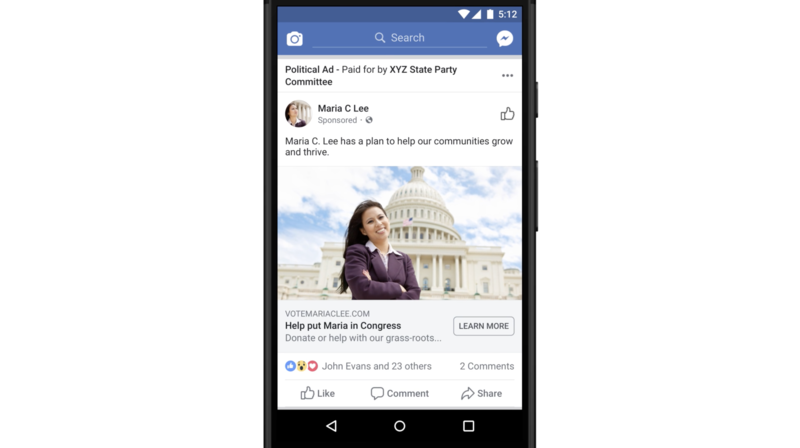 Facebook is also making changes to all advertiser Pages on its platform — not just Pages that run political ads. In June, Facebook plans to release a feature called 'View ads' that will let any user see the ads a Page is running, even if they aren't targeted at them or don't appear in their News Feed. For political Pages, the feature will be even more sophisticated and will provide a public searchable archive of all the Page's political ads with information on the amount spent and the target demographic for each ad. Finally, Facebook is also requiring that people who manage Pages "with large numbers" of followers be verified (a concrete threshold on the number of followers isn't stated). Users who fail to verify their identity and location will be barred from posting on the Page. In making it harder for fake accounts to manage a Page, Facebook hopes that it will also help to crack down on the amount of fake news that have been increasingly proliferating on social media.